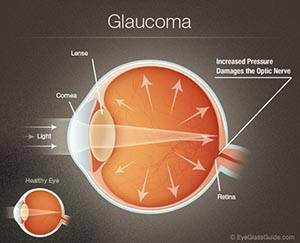 Glaucoma is a general name for a group of eye diseases that damage the optic nerve of the eye. Glaucoma prevents the eye from sending accurate visual information to the brain. Usually associated with gradual (and sometimes sudden) increases in pressure within the eyeball itself, glaucoma can result in partial or total blindness over time. The damage caused by glaucoma is irreversible, and it is currently the second-leading cause of blindness in Americans over age 40 in the United States. Currently, glaucoma affects nearly 2.5 million Americans. And while anyone can develop glaucoma, the disease is most common in people over age 40, particularly African Americans. Glaucoma is five times more likely to affect African Americans than Caucasians, and roughly four times more likely to cause blindness. In addition, people with a family history of glaucoma stand at a higher risk to develop the disease, and anyone over age 60, particularly Mexican Americans, faces an increased risk of glaucoma. Glaucoma refers to a category of eye disorders often associated with a dangerous buildup of internal eye pressure (intraocular pressure or IOP), which can damage the eye's optic nerve – the structure that transmits visual information from the eye to the brain.